The Google Search Console integration brings Google search metrics into your SEO tool in HubSpot. Google Search Console is a free tool for anyone with a website. The metrics from the integration include the number of views and clicks your website gets for specific search terms related to your topic. You can also see the average position of where your website shows up on a Google search results page. Please note: even if you're new to SEO, it's easy to set up Google Search Console for your website to see how it's performing in Google search results. In the upper right, search for Google Search Console. Hover over the Google Search Console integration and click View integration. Click Connect to Google Search Console. Enter your Google credentials, then click Allow to grant HubSpot permission to connect your Google account. Please note: our Google Apps integrations request permission for all Google tools available in HubSpot. HubSpot won't ask for access to contacts, calendar, or email unless you use your Sales Hub tools to connect with Google Calendar or Gmail. To see your Google Search Console metrics in the SEO tool, you must add the domain for your HubSpot content into your Google Search Console account. If you're referencing a domain in your SEO tool that isn't found in your Google Search Console account, you'll see an alert in your SEO dashboard that the account needs to be connected. In the Connected Sites section, you'll see which sites are Verified and which sites are Unverified. If your site is Unverified, there are a few ways you can verify your site ownership with Google. One of the easiest ways is to add an HTML tag to the head HTML of your HubSpot website. Please note: if you use an HTML tag to verify your site, there must be a published page at the exact URL of the site you're verifying. Once you’ve verified your site, you can add website properties for all of the subdomains you're tracking in SEO. Google Search Console requires that you add each subdomain, so you'll need to add www.mydomain.com separately from blog.mydomain.com and mydomain.com. Additionally, you'll need to add a separate site property for the secure version of your site as google regards this as a separate site. This means you will need to add https://www.mydomain.com in addition to http://www.mydomain.com. Please note: if you have questions about how to add your website properties in Google, refer to Google's Support documentation. Average position: your website domain gets a numeric position value based on its position on a Google search results page, where position 1 is the top position. This number gives you a high level understanding of how your website is performing in search results related to your topic. Learn more about how this position is calculated. Please note: the Average position number you see in your SEO tool won't exactly match the Google search results for you on your own topic phrase. Your location, search history, device type, and other dynamic factors affect these results every time you search. Total impressions: an impression is counted each time your content appears in search results for your topic phrase. Average click through rate: the average number of times someone clicked on your content in a Google search results page. If an individual clicks the same link multiple times, it will only be counted once. Top search queries: these are the search terms where your content appears in Google search results. You can see top search queries in the Optimization panel in the page or blog post editor, and in the Subtopic content details panel in your SEO tool. On your dashboard, click Switch Columns. 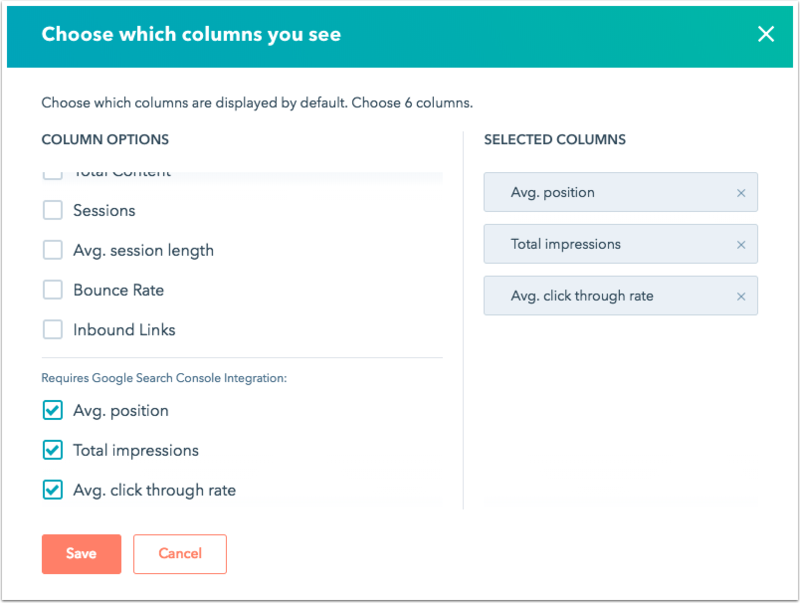 In the dialog box, select the checkbox for the Google Search Console metrics you want to track on your dashboard, then click Save. Click the name of the page or blog post you want to analyze. In the left sidebar menu, click Search Queries. You can use the Date range dropdown menu to adjust the date range for your metrics.